Lillian Larsen began her career teaching math at an urban high school. Today, as a professor of religious studies, her greatest joy remains working with students. Larsen started studying ancient texts and focusing on Graeco-Roman and early Christian school settings while she was in the classroom. This sparked her interest in early monasticism as a locus of moral and civic formation. While she utilizes cutting-edge technology in her work, she most enjoys face-to-face collaboration with other scholars and hands-on engagement with ancient artifacts and documents. 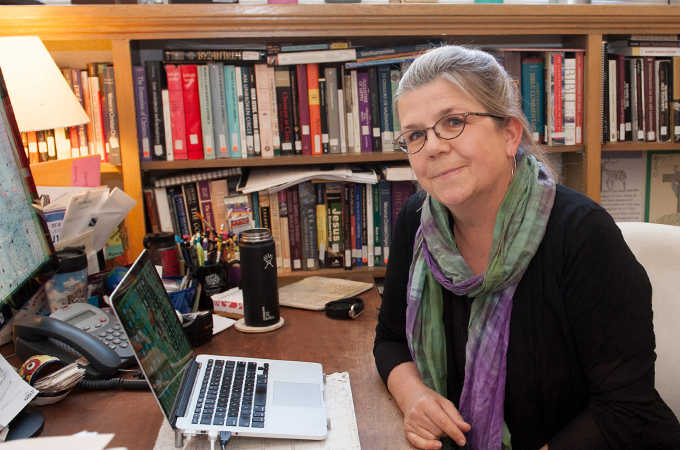 At Redlands, Larsen works with faculty and students in spatial studies and geographical information science to find new ways to visualize early Christian, monastic, and religious ideologic exchange. In using spatial tools to critically engage historical and religious landscapes (and vice versa), she emphasizes that “as educators, we have the responsibility of making learning both meaningful and accessible.” Both in working with ancient artifacts or deploying technology, she explains, “my goal is to bring the human voice into our studies... Simply collecting data without thinking about what it represents reduces its importance.” Whether visualizing religious exchange or displaying artifacts from ancient monasteries in the world’s museums, context is essential. For much of the past decade, Larsen has worked with colleagues at Lund University in Sweden on grant-funded research aimed at contextualizing early Christian monasticism within a broad trajectory of classical education. Additional recent publications include three separate book chapters: “Monastic Paideia: Textual Fluidity in the Classroom” in Snapshots of Evolving Traditions: Jewish and Christian Manuscript Culture, Textual Fluidity, and New Philology (Degruyter); “Mapping Religiously, or Religiously Minding the Map?” in Mapping Across Academia (Springer); and “Isidore of Peluse: Monastic Mirror and Montage” in Late Antique Letter Collections: A Critical Introduction and Reference Guide (University of California).